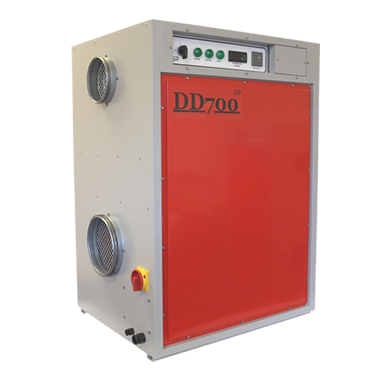 The DD700 desiccant dehumidifier is an upright, compact design, which makes it easily accommodated within space restricted areas. The unit incorporates a PTC Heater ensuring maximum drying is immediately reached, and constantly maintained while the unit is running. The DD700 incorporates two EC fans with variable speed allowing the unit to be easily installed and commissioned in a wide range of applications. An electronic thermostat allows and fully variable EC fans, allows the user to select the desired drying preference , ie High Efficiency, Deep Drying, or High Extraction.